Purosol Microfiber Cloth is engineered to be used with all Purosol molecular cleaning products. The product is made to Purosol's specifications using the latest in advanced fabric technology and is woven to release dirt particulates when used with the Purosol line of formulas without damaging the surfaces on which it is applied. Designed to be washable and reused multiple times, Purosol's MicrofiberCloth is the perfect complement to its revolutionary line of formulas. The product is attractive and combines the softness, resiliency, absorption, and durability to many applications. Purosol Optical Lens Cleaning Solution - Small 1 oz. Purosol Optical Cleaner - Using cutting-edge technology that is environmentally friendly, enzyme-based Purosol is the first product of its kind to clean at the molecular level - neutralizing the bonds that dust, dirt, oil, and grime use to adhere to glass or plastic lens surfaces. 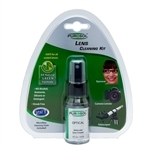 Purosol Lens Cleaning Kit - Small 1 oz. The Purosol PUOC-10078 Optical Lens Cleaning Small Kit contains lens cleaning solution designed to be environmentally friendly. The enzyme-based Purosol cleans at the molecular level, neutralizing the bonds that dust, dirt, oil, and grime use to adhere to glass or plastic lens surfaces. Unlike many other cleaning solvents, Purosol is completely safe, and will not harm your lenses. This unique solution lasts longer than other solvents, and is designed specifically for the demands of high-end, multi-coated lenses. Purosol Optical Lens Cleaning Solution - Medium 2 oz. Purosol Optical Lens Cleaning Solution - Large 4 oz. This is the OP/TECH USA Classic Strap™ that we use on our rentals with Lensfly.com printed on it. The tailored design of the Classic Strap™ is made with soft, durable neoprene combined with a unique "Comfort-Stretch" binding. While the neoprene evenly distributes the weight, the unique binding gives added support to eliminate shoulder and neck fatigue.